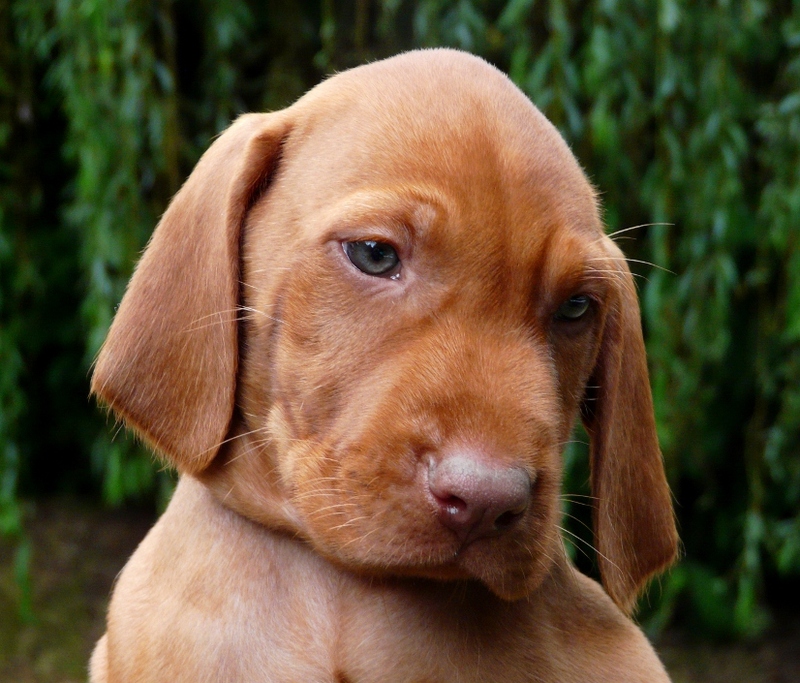 Puppy Portraits: Week 7 | Belatarr Hungarian Wirehaired Vizsla. The final week that the babies will all be together – where did all that time go!? Most of the pups will be heading off to their new lives at the end of the week, so, now that everyone has been allocated, we can finally reveal their Kennel names & destinations. Our previous Jazz litter were named after their father, Mingus’, so for this litter we wanted to continue Phoenix’ name theme. 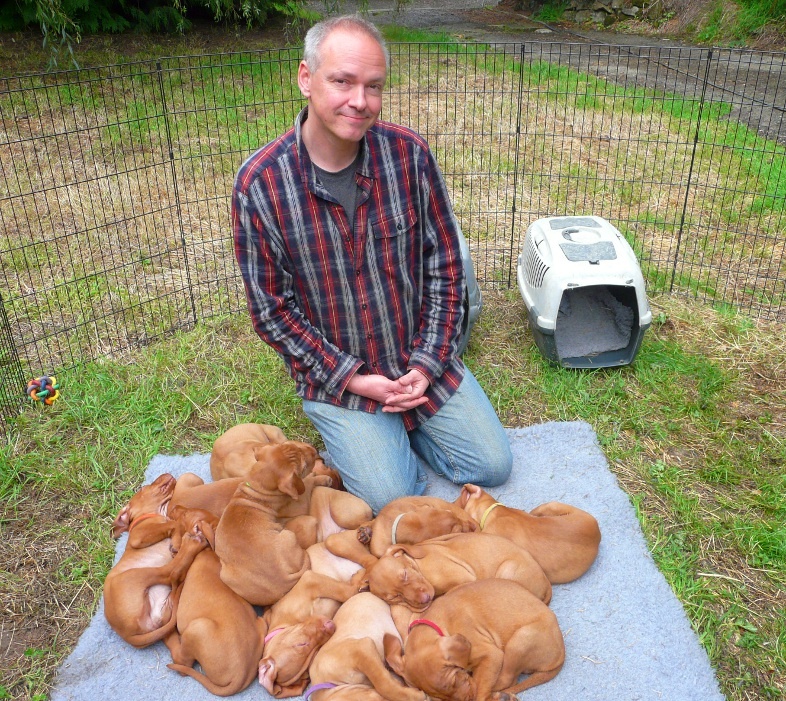 As a result all the pups have all been named after constellations, following on from the Phoenix Constallation. Kofi, Mr Black, will be heading off to join Vivien, Lox & senior GWP Freddie in Berkshire. 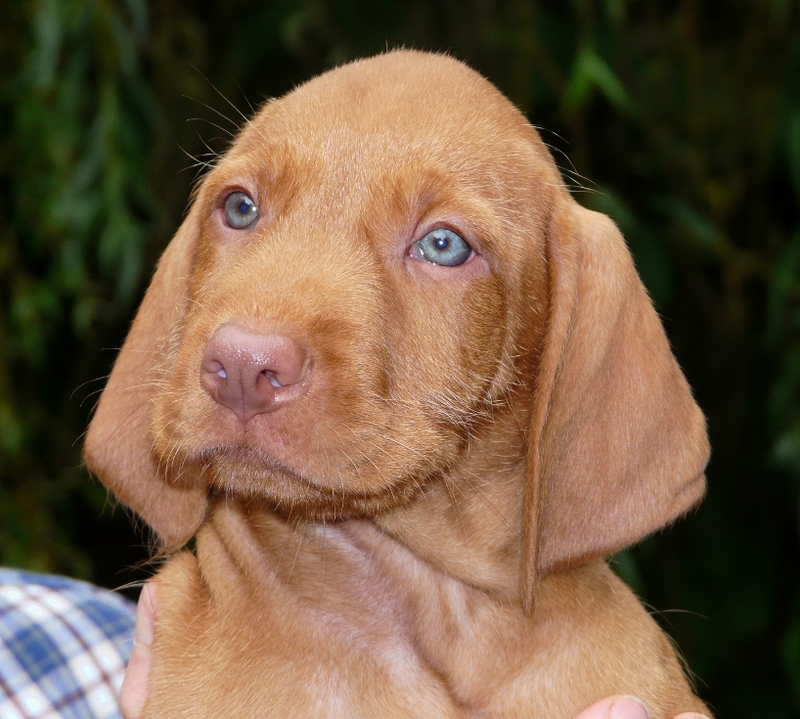 Always a very strikingly handsome boy right from birth, Kofi will be gundog trained and, along with some of his brothers and sisters, will also be heading to the show ring next year – can’t wait! 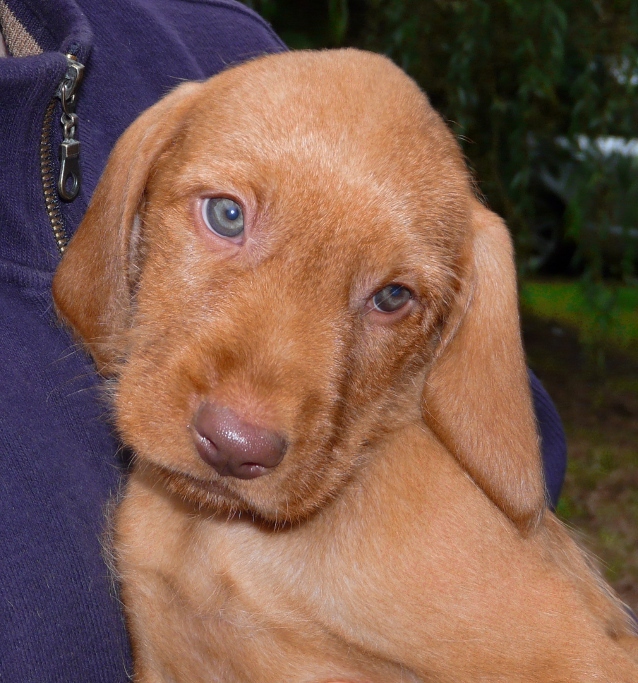 Rusty, Mr Blue, was the first boy to leave the nest & this very sweet boy joins a thoroughly smitten Ian & Anita in Chichester where many cuddles and adventures undoubtedly await them all. Percy, Mr Bronze, is another very striking boy, picked out by many visitors and blog-watchers, particularly for his intensely dark red coat. 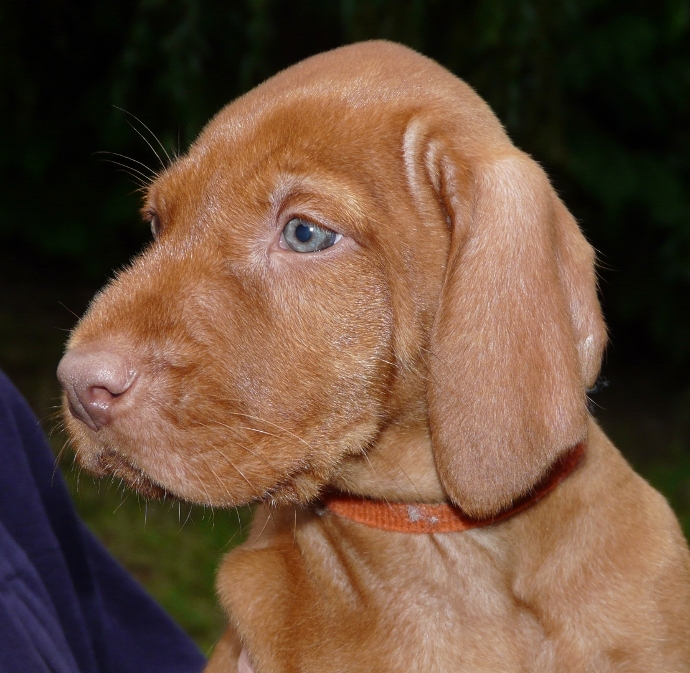 He joins a very excited Copper the HWV along with Jan & family in Chichester and we hope to see him out in the ring next year too! Herc, Mr Green’s, specialty is soaking up as many cuddles as he can secure. His melting expression and super-huge ears mean that cuddles tend to come thick and fast! 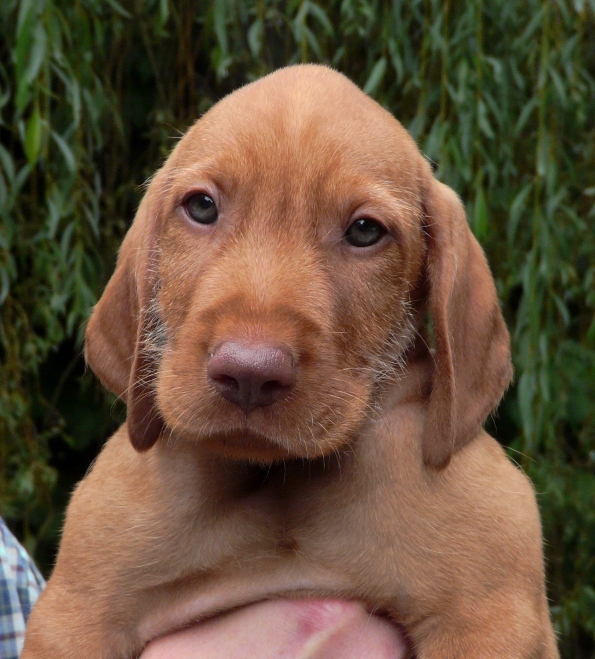 He joins big brother Belatarr Charlie Parker, along with David, Jenny & Oz the Lab in Northants and will also be joining Charlie in the showring from next year – very exciting! Fergus (Mr Red) is a big boy with a big heart and from a very young age looked like the spitting image of Finley, Belatarr Art Tatum, so it only seemed fitting that he now joins big brother Finley along with Carole, Chelsea & Emma. 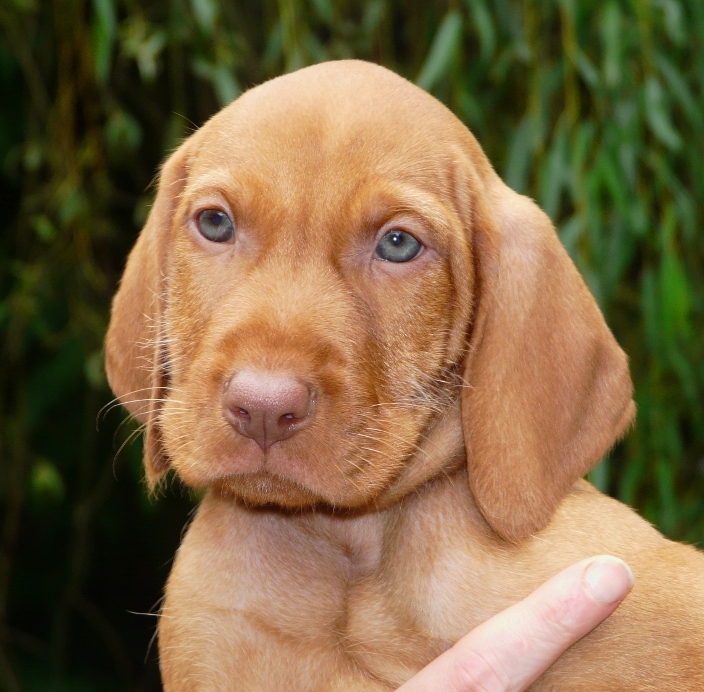 They are just 3 miles away from us here at Belatarr HQ, so we will be delighted to be able to watch this handsome chap growing up at close hand. Ava, Miss Fawn, was pretty much always destined for the show ring, and now joins Liz, Barry, Scooby the HWV and Dodd the Leonberger in Telford where this elegant young lady will live right beside sister Halle. We can’t wait to see these two sisters growing up. Gertie, Miss Orange, heads even further West to Cornwall where she instantly became the centre of all attention for Sarah, Paul & a very excited young Jack. We hope that this confident, outgoing and beautiful girl will fulfill all of their long-held HWV dreams. 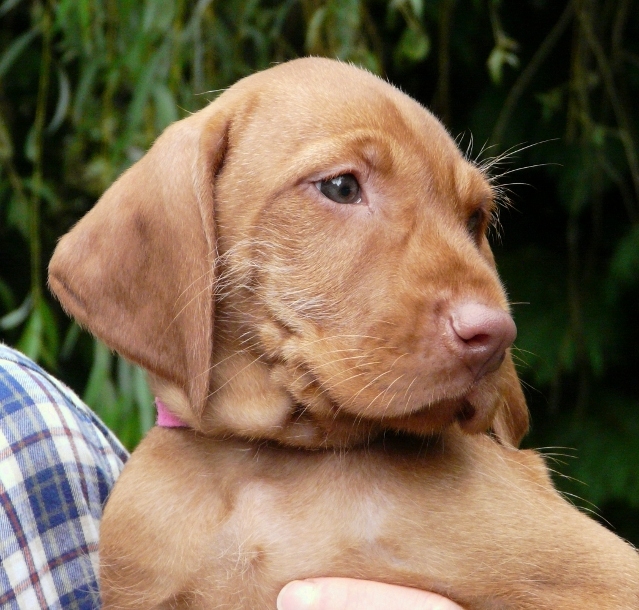 Twiglet, Miss Pink, is definitely the sweetest and most polite of the litter, and this pretty and gentle girl seemed like the perfect pup for Kathy, Paul & a thoroughly besotted young Millie in Surrey. 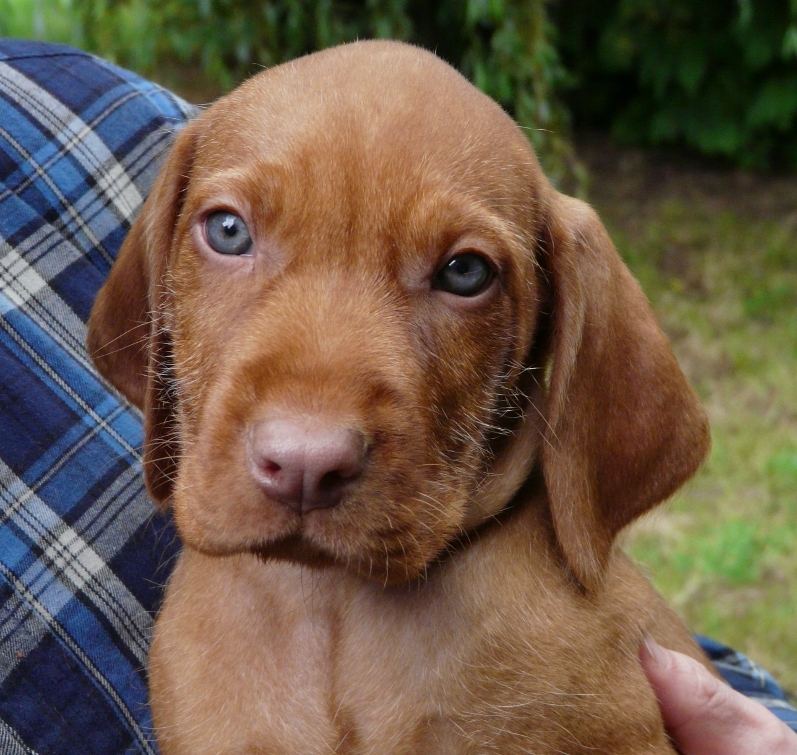 Halle, Miss Purple, very nearly stayed here with us, but was finally destined to live with Tom, Gail and their two Border Collies where she will undoubtedly share many adventures with her sister, Ava, who lives just a few houses away in Telford. Tom & Gail are very keen to learn to show and we are sure that Halle will make the most wonderful and rewarding girl for them to learn with. 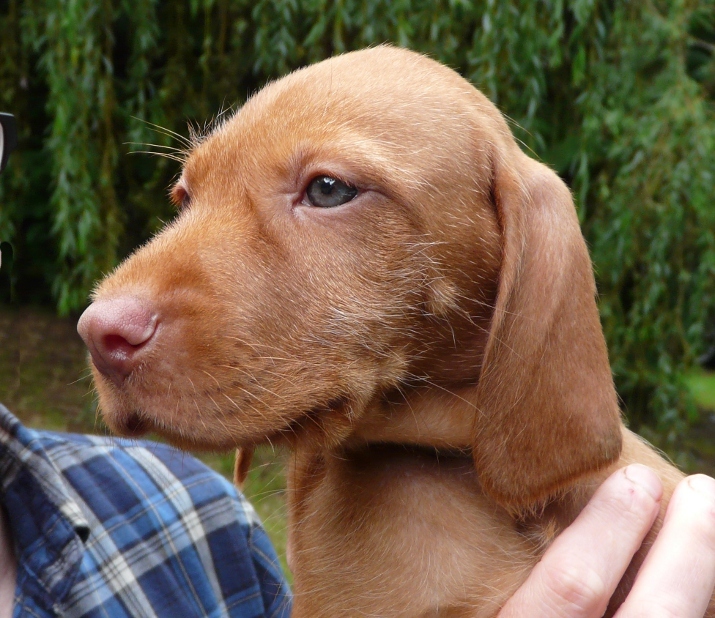 Kaia, Miss White, is quite the adventurer and was the perfect match for experienced HWV owners Tim, Laura & family on the Kent/Sussex border where she will have a lovely outdoor life and may also be trained to track when she’s a little older. Cooroo, Miss Yellow, is the only one of the pups who will be flying to their new home. A true adventure awaits her in a few days when she jets off to join Will, Jess & young Arlo for a life of endless beaches and woodlands on St Mary’s in the Isles of Scilly. 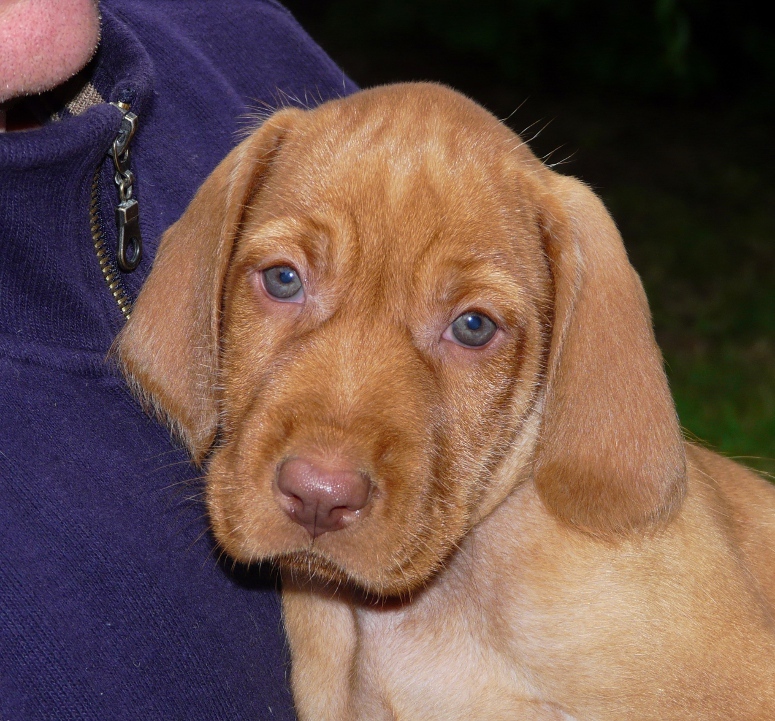 Entry filed under: Belatarr, Hungarian Wirehaired Vizsla, Puppies. 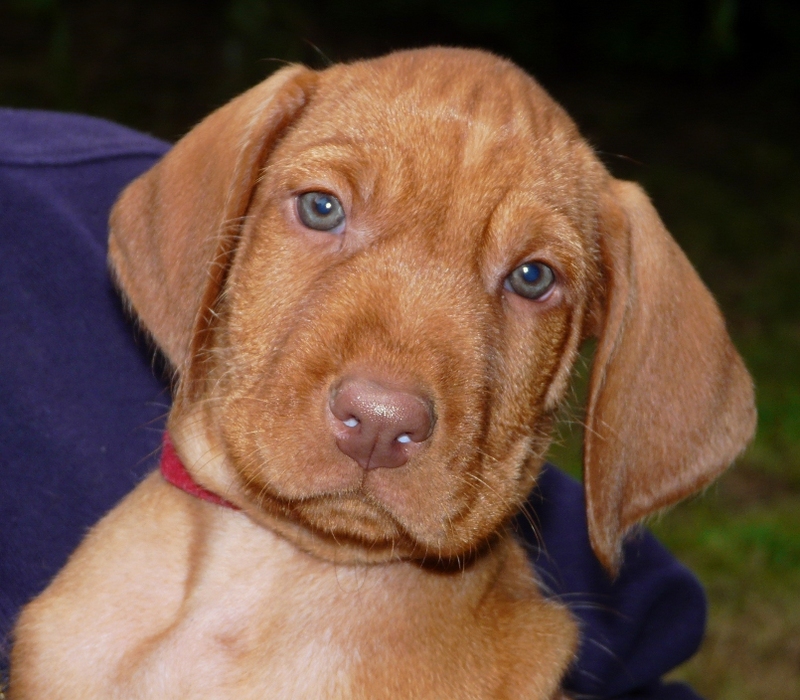 Tags: Belatarr, cuteness, Hungarian Wirehaired Vizsla, HWV litter, HWV puppies, Puppies, Wirehaired Vizsla. Puppy Portraits: Week 6	Introducing Lyra! 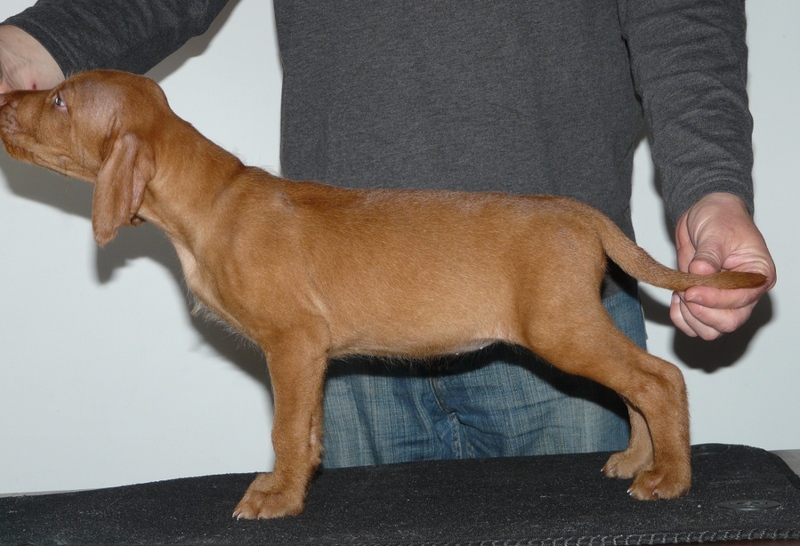 Is the photo of the pup your stacking miss fawn by any chance ? Can’t believe how they’ve grown, have any gone yet? Any idea who your keeping yet? They are truly beautiful – please keep in touch regarding future litters I really would appreciate it. Congratulations.